Magnificent view of the valley from back windows and raised deck. Very private location and at the same time within a short proximity to Manchester Center with great selection of restaurants and designer outlet stores. Short distance to all main Southern Vermont skiing areas. 20 minutes to Vermont Summer Festival Horse Show in East Dorset. 20 minutes to Olympic size Riley Rink with public skating sessions, 'sticks and pucks' and other on-ice activities. $50 added to cleaning fee to cover laundry expense. Clean, has all the amenities needed for a great weekend. Close to slopes and town. Second year in a row, great house near slopes. Layout is good for our family, with adult children. We loved our stay in the chalet. It was centrally located to the places we wanted to visit but still had the cozy "away from it all feeling". The view from the back deck was breathtaking and inside we really enjoyed the stone fireplace. Andrei was so easy to contact. Wish we had the time to stay longer. This was the perfect spot for my family to spend a few days visiting friends and skiing at Bromley. The house was comfortable and the location was great. 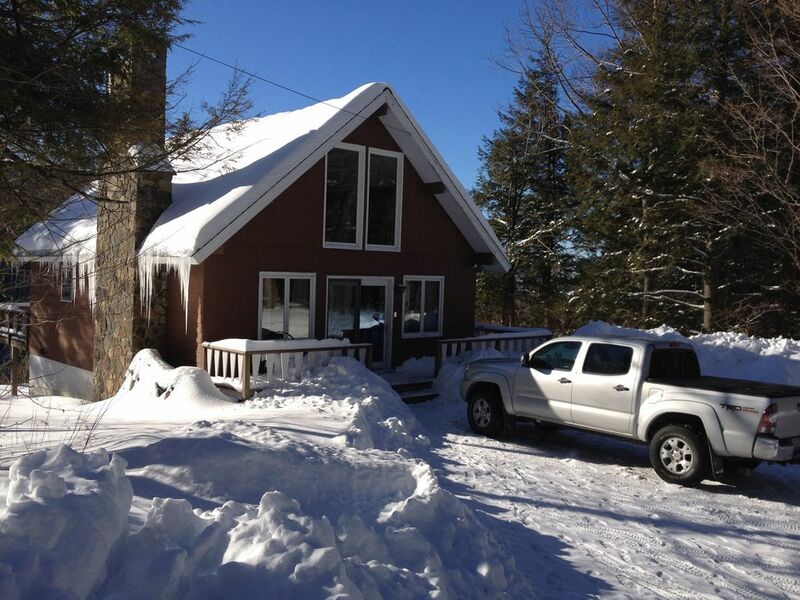 Easy access to skiing and Manchester Center, a nice sitting area, and a functional kitchen. We're very pleased. Andrei was a super host! The house is very close to Bromley which is where we skied. The views from the house are beautiful. I must say, this was our first time renting and air b&b and it was a great experience. The hospitality was magnificent. The home was clean, well kept, and as advertised. The view from the deck made the trip all worthwhile!! Highly recommend this rental. Loved this place- ideally located between Manchester and Peru, leaving guests with multiple options of things to do and places to explore. The cabin is very comfortably appointed and well stocked with wonderful views off the back deck. The owner, Andrei, is easy to work with and responds promptly to inquiries. We loved this place and hope to return again. A full kitchen with pots, pans and all the utensils and flatware. The TVs have Roku with lots of streaming channels. Free wifi fast internet access. Playroom with table games and Xbox 360 (bring your own games or enjoy our sports package collection). We provide linens and towels. $50 added to cleaning fee to cover laundry expense. House must be returned to the condition found upon arrival. No smoking inside the house.